Updated the blog with an entry of EmberJS based on the suggestion of one of the readers. Please feel free to suggest others. 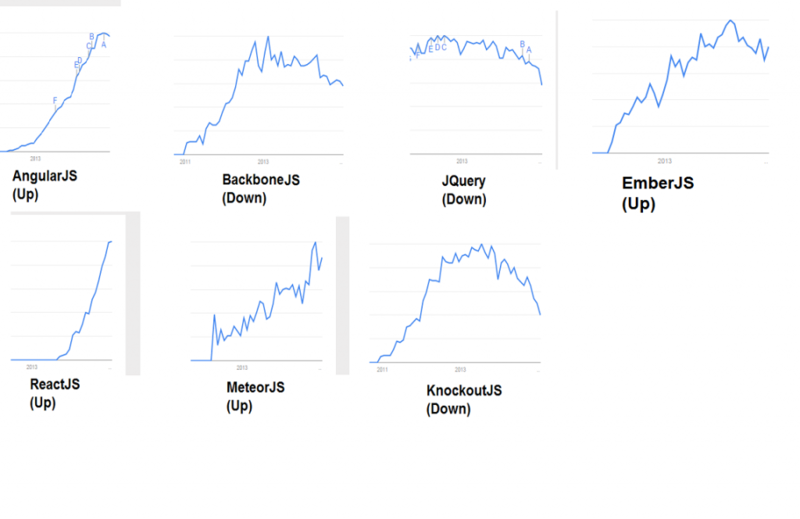 Following image represents search trends on above-mentioned JS frameworks, being captured from google.com trends website. MeteorJS: Important thing about MeteorJS is that it does not yet support windows version and still is showing upward trend. The above framework however shows up like following (in order) based on search done and hence, popularity in US. AngularJS: Interestingly, AngularJS is searched most by developers out of India. It is also interesting to observe that following three frameworks have been declining in its popularity from the perspective of search happening at this time in comparison with starting of 2014. 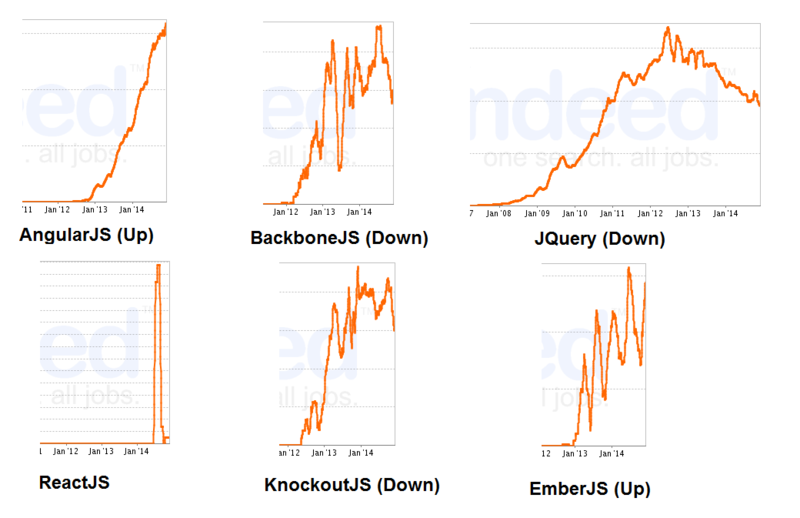 Following image represents job trends on above-mentioned JS frameworks, being captured from indeed.com trends website. JQuery is not going to go soon anywhere. However, it will certainly be interesting to watch how it shows up in near future in term of adoption. 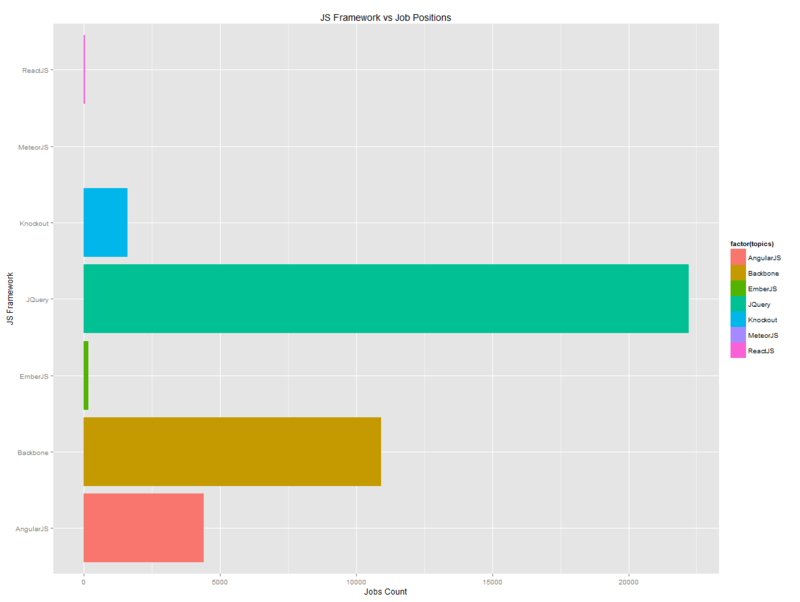 Following represents the number of job positions consisting of keywords related with above JS frameworks. It represents the fact that still JQuery rules, but also indicates that AngularJS is catching up. Are all y scales in trend plots the same? Thanks for your updates! Thanks for your comments, Alex. The plots are just meant to showcase the trends based on google search and job positions. These are not meant to represent facts like which framework would secure you a job or so. The objective is to inform JS developers about emerging JS frameworks and the fact the frameworks are worth a shot.